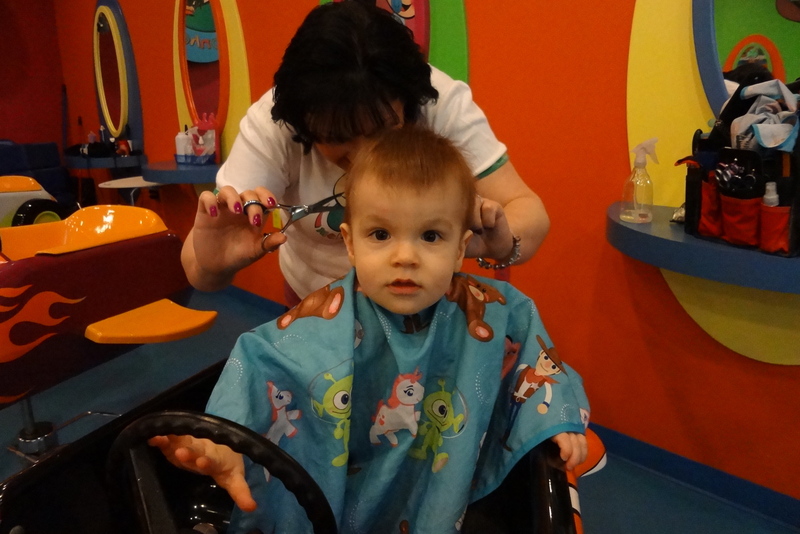 Since I last made an appearance on this sorely neglected blog, Nicholas has had his first (real) haircut. He went to Melonheads, just like his big brother, and sat in an airplane seat while Thomas sat in a Thomas the Tank Engine chair nearby. More importantly, last week Nicholas celebrated his first birthday. The party was lots of fun. Baba and Grandpa and Auntie Evelyn were all there, Grandma joined us by Skype, and the birthday boy was in fine spirits. He was delighted with all his presents, including the Fisher Price house that Dave and I bought for him. He spent a lot of time just going back and forth through the little door to the amusement of all the grownups. Sadly, many of the other features didn’t work properly. For example, hitting the doorbell produced some weird garbled music and random noises. So, after the cake was eaten and the guests had gone home, Dave was at Toys ‘R Us half an hour before closing, exchanging the fully-assembled dud of a playhouse for a new one in a box. Which he then put together in a state of exhaustion so the boys could wake up to their new toy none the wiser. Here’s the highlight reel, plus the picture of the haircut again, which for some reason WordPress won’t let me exclude from the slideshow. Nicholas has made the leap from walking around the furniture to just…walking. Dave and I were talking in the kitchen one day and looked up to see him coming toward us with a big grin on his face. And now he’s doing it every day as if it were nothing at all. Could be almost anywhere, really. Here are some of the places the vehicles have ended up lately. 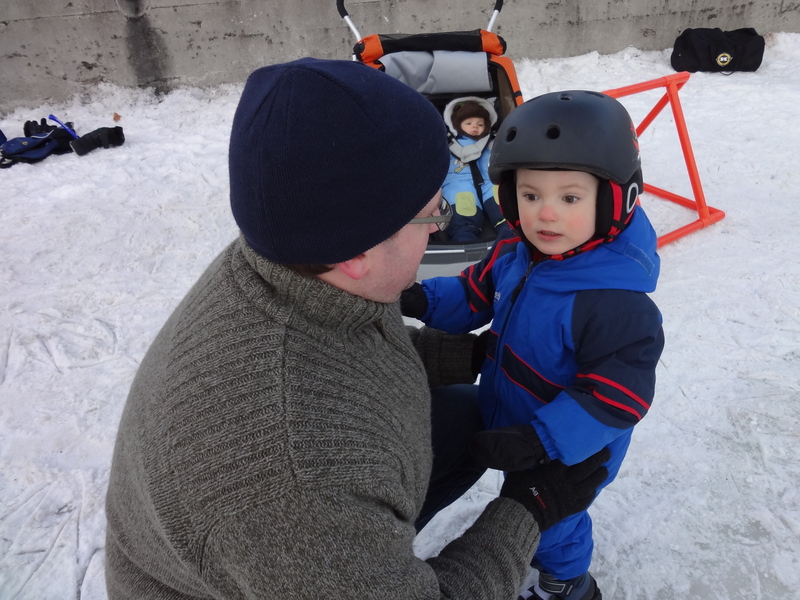 The annual Winterlude festival is on now in Ottawa, so last weekend we took the boys. Pre-kids, Dave and I typically celebrated by looking at a few ice sculptures and skating on the canal. 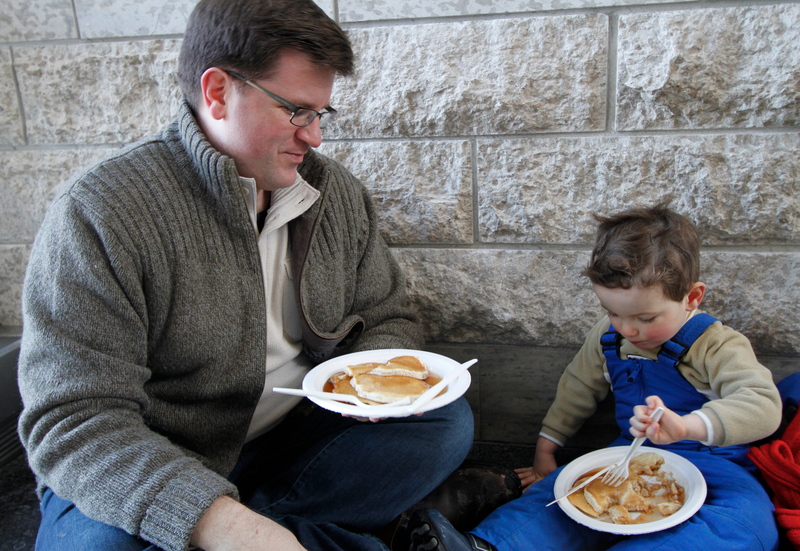 But this year, we went first thing in the morning to the kickoff event at city hall – a pancake breakfast. You see, Thomas adores Curious George. And in his big collection of George stories, there is one in which George attends a pancake breakfast. He gets into all sorts of trouble when he decides to help make the pancakes. He gets covered in syrup, then the napkins get stuck to him and he decides to wash himself off in the dunk tank. Of course, George is a big hero by the end of the story, because people love his pancakes and the fundraiser is the biggest success ever, thanks to him. This week, we took Thomas to (we hope) his last-ever speech assessment at CHEO. He didn’t make it easy for the therapist to assess him, since he only wanted to talk about trucks and vehicle-related things, but she managed. And it seems he is now fully caught up in terms of vocabulary and the grammar he is using. Thomas: (looking at a book) That’s a BIG TRUCK!!! Thomas: It’s coming towards us! Me: Yes, it’s a beach ball. It’s pretty amazing to hear your child saying words and combining them in ways you have no memory of teaching him. It seems clear that during his long silent period, Thomas was absorbing incredible amounts of language information. Which makes sense, now that we know a little more about his personality. He’s quite a cautious little boy. And we always did have the feeling that he understood a lot of what was being said to him, but we (David and I, but me especially) didn’t want to second-guess the experts too much. At any rate, it is a huge relief and a pleasure that he now speaks so well. I suppose things would have worked out all right in the end if we’d never bothered to take him for any of these appointments, but we learned a lot of things that will perhaps be useful when Nicholas starts to learn to talk. Z is for zebra, taking a bath. I highly recommend this book as a gift. The pictures are beautiful, and there’s lots going on in them to keep little minds occupied. A two-year-old couldn’t possibly grasp it all, but from the reviews I read on Amazon, it seems to be quite popular with this age group. Today we took Nicholas out to the canal for the very first time, and Thomas for the first time on skates. The skates are strap-on blades from Canadian Tire that attach to his boots. He also has a new, huge black helmet that makes him look like Darth Vader, and an orange frame to help him balance. Overall, I think this first skate went pretty well. Thomas skated (well, kind of walked on his blades while holding on to me or his dad or the frame) to Pig Island from the Bank Street Bridge. We were hoping to get all the way to Fifth Avenue to get Beavertails, but Thomas started to get a bit impatient. So we took off the skates and loaded him back into the stroller, where he and his brother happily chatted during the walk home, and admired the beautiful pink wintry sunset (“Rainbow colours in sky!” said Thomas). Nicholas seemed happy as a clam to be riding in the big stroller despite the cold (-10C), though we will have to keep an eye on him, as he has a way of worming out of his mittens in order to better explore the stroller compartment. Hey diddle cat fiddle cow jump moon! Thomas is quite into nursery rhymes these days, somewhat to our surprise. 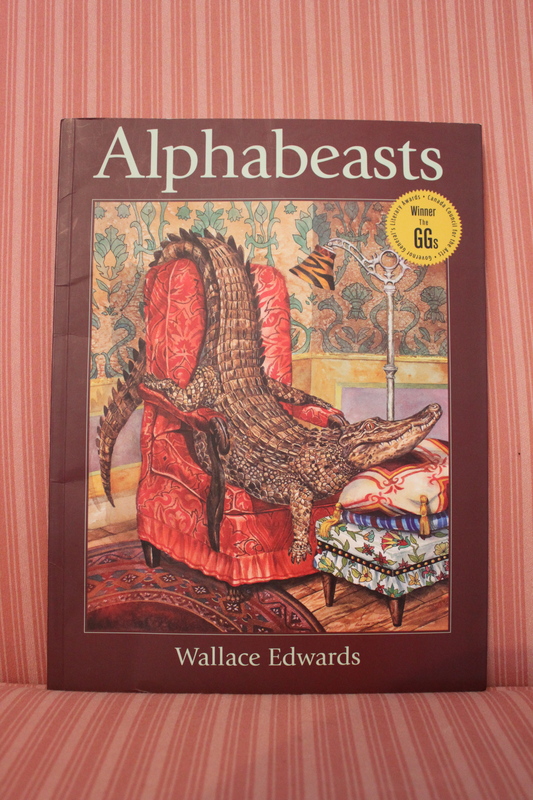 It all started with, of all things, the placemat he uses at mealtimes. It’s a handy little thing with a lip at the front that catches breakaway food bits, but Thomas is more interested in the pictures on it. There’s a cow jumping over a moon, a little dog and a dish and spoon. So I recited the rhyme to him and he was intrigued. In what seemed like no time at all, he was saying it himself from memory, or at least a pretty good version of it. Since then, we’ve gone on to teach him Jack and Jill and more recently, Humpty Dumpty. For some reason he prefers to say them at top volume (“Is loud!” he says afterward), and to improvise on some of the verbs. So Jill is “coming boom after” instead of tumbling, which we think is pretty cute. It’s interesting to dredge up these old rhymes from memory to teach them to Thomas. As a kid I don’t remember finding them especially strange, but to grown-up ears the stories are really quite weird, aren’t they? As we were driving back from Toronto this past weekend, Dave and I were wondering aloud where Humpty Dumpty came from. I mean, a giant egg sitting on a wall? Why? Dave said half-jokingly (I think) that it was probably about a revolution or something. Well, it turns out he was right. This article details the origin of all kinds of nursery rhymes, starting with Humpty Dumpty. It’s not a terribly cheerful read, but very interesting.